National Organization for Marriage President Brian Brown announced this week that Tea Party darling and Fox News contributor Dr. Ben Carson is is scheduled to be the keynote speaker at NOM’s first Gala dinner in mid-June. It was a crisp winter day in 1973 when the United States Supreme Court issued their horrific decision in Roe v Wade. How much would you sacrifice to go back in time to a few months before that fateful decision, to the Fall of 1972, and mobilize the American people BEFORE the Supreme Court issued that infamous decree? Just about anything, right? Well, when it comes to marriage, we have that chance! You see, it’s 1972 for marriage. Within the next 12 months, it is very likely that the United States Supreme Court will take up the marriage issue again. Many people have bought in to the lie that the courts redefining marriage is somehow “inevitable.” Well, I refuse to believe that, because it’s simply not true! That’s why the National Organization for Marriage (NOM) is organizing its second annual March for Marriage this summer on June 19th in Washington, DC — bringing together thousands of marriage activists from all across the country to make sure the elites in our nation’s capital hear loud and clear: Marriage matters because every kid deserves a mom and a dad! One incredibly courageous leader who is standing up for marriage is Doctor Ben Carson, who will be the keynote speaker at NOM’s first ever Gala dinner on the evening of the March for Marriage. He said in a speech earlier this year that the “P.C. police” have “tried to shut him up” because he’s willing to state his belief publicly that marriage is between a man and a woman. 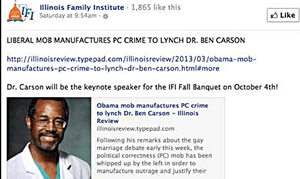 Last year Carson also keynoted the at the Illinois Family Institute’s Fall Banquet. The IFI is an officially recognized extremist hate group.